The effect of the strike deepened with the engineering sector being hardest hit. The strike began to have a huge effect on agriculture, with uncollected or unprocessed milk having to be dumped & fresh food not reaching shops. The UWC issued a list of ‘essential services’ which were to be allowed to operate as normal & also issued a telephone number for anyone engaged in such work. All pubs & licensed premises were ordered to close, in order to minimise any risk of public disorder. In many areas across Northern Ireland, the RUC & Army moved in to remove barricades. Loyalists criticised the Security Forces, accusing them of heavy handedness (some RUC officers were accused, not without foundation, of outright thuggery) Meanwhile, Irish nationalists & ‘liberal’ Unionists accused the police & Army of not doing enough to break the strike, with the SDLP being most vocal, urging the Army to “sweep these Loyalist rabble-rousers off the streets”. Merlyn Rees, Secretary of State for Northern Ireland, met with Unionist leaders at Stormont, controversially however, Rees categorically refused to meet with, or enter into discussions with, the Ulster Workers Council. As the effects of the strike began to bite harder, major disruption was caused to daily life in NI. Petrol supplies began to dry up & further electricity cuts meant that even when filling stations had fuel, they were often unable to operate their pumps. Postal delivery services came to a halt. The problems with food distribution began to become more serious & widespread. Special arrangements were made by the Northern Ireland Executive to ensure that welfare & pension payments would be delivered to claimants. Vanguard leader, William Craig, launched a scathing attack on Merlyn Rees for refusing to meet with strike leaders. A sentiment echoed by the Conservative Party’s Northern Ireland spokesman, Francis Pym. Meanwhile, news broke of the Dublin/Monaghan bombs & the terrible loss of life. Sadly, many Loyalists, desensitised by 4 years of indiscriminate republican bombings of civilian targets, actually greeted the news with cheers. With the benefit of hindsight it is easy to see that the bombing of civilian targets in the Irish Republic was counterproductive for Loyalism, at the time however, many ordinary Loyalists regarded such attacks as entirely justified. Indeed, the UVF may well have considered the attacks justifiable, as a graphic demonstration of Loyalist resistance to the hated ‘Council of Ireland’ component of Sunningdale. Today, it is easy to see things through the lens of contemporary morality, but that is an unhelpful perspective. Of course it is morally wrong to cheer the violent death of any person, but in the context of NI in 1974, such cheers were only to be expected. Similar behaviour was demonstrated by both communities in subsequent years, though of course, one never hears the anecdotes about republicans cheering when, for example, the bomb exploded in Frizzell’s fish shop on the Shankill Road in 1993. The Ulster Workers’ Council issued a statement calling for an all-out stoppage to begin at midnight on Sunday. More & more shops & businesses closed as the strike began to gather more & more momentum. Merlyn Rees again came in for fierce criticism, as he once again refused point-blank to meet with the UWC. Merlyn Rees, Secretary of State for Northern Ireland, announces a State of Emergency. Rees flew to Chequers, country home of the Prime Minister, for talks. The United Ulster Unionist Council met & agreed to support the Ulster Workers’ Council. 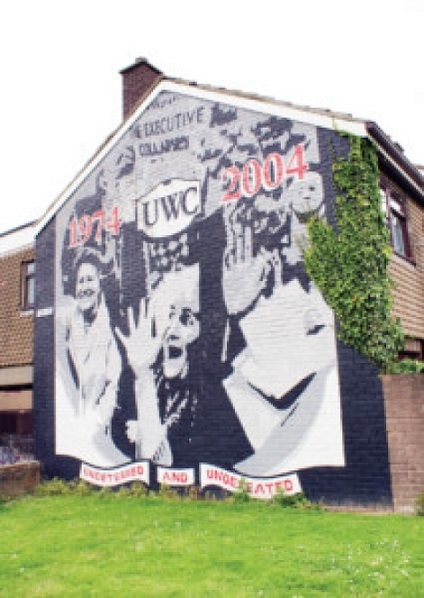 The UWC withdrew its call for a total stoppage as of midnight, as some shops reported panic buying & the RUC issued dire warnings of “severe consequences” of an all out stoppage. 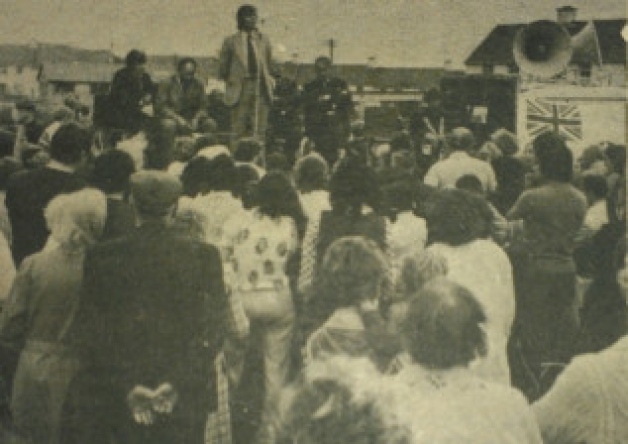 The UDA’s Glenn Barr addressing a rally in support of the strike, Irish St, Londonderry. Many roads across Ulster were closed by Loyalist strikers, these road closures were so effective that some members of the Executive, including Brian Faulkner, had to be airlifted in & out of Stormont by the RAF. Electricity generation dropped to about one-third of normal levels. People were asked only to use telephones in an emergency. Five hundred additional troops arrived in Northern Ireland. A revised list of those services which were to be allowed through roadblocks & the opening times permitted for shops was issued by the ‘Ulster Army Council’. TUC leader, Len Murray, arrives in Belfast to lead a ‘back to work march’. hate-filled marchers by around 200 RUC personnel (who outnumbered the marchers!) The farcical affair came to end when the marchers finally moved off, though they were so disheartened (& probably embarrassed) that they didn’t even bother to complete their proposed route! Another ‘back to work’ march due to start at Cregagh Industrial Estate, attracted only 17 people. In an attempt to resolve the strike the Northern Ireland Executive agreed to postpone certain sections of the Sunningdale ‘Agreement’ until 1977 & to reduce the size of the ‘Council of Ireland’. These proposals were rejected by leaders of the Ulster Workers’ Council & other Loyalist leaders. The Westminster government repeated their stance on not negotiating with the UWC. 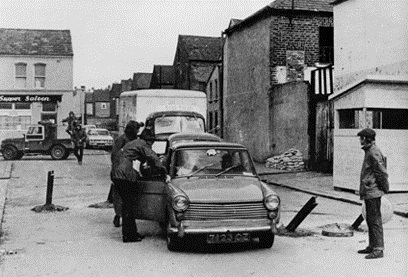 The Army moved in to remove barricades in Loyalist areas across NI, though most were replaced soon after. Workers in Londonderry were prevented from getting to Maydown Industrial Estate. Although many schools managed to operate during the strike it was reported that some GCE examinations were affected. Gerry Fitt, ‘Deputy Chief Executive’, called on the government to send troops to the power stations and the oil refineries. A UDA vehicle checkpoint, East Belfast. Talks were held at Chequers, involving: Harold Wilson, Brian Faulkner, Gerry Fitt & Alliance party leader Oliver Napier. A terse statement was issued after the talks stated that there would be no negotiations with the strike organisers. By now, the role of government had been so usurped by the UWC that many government departments took to counterfeiting UWC passes & petrol coupons, something that quickly came to the notice of the strike organisers, who simply changed the paper to another colour. The fact that the UWC was able to react so quickly to the counter initiatives from Stormont led people to believe that there were Loyalist/Unionist spies inside Stormont. There were -including a member of the Executive, Roy Bradford. When the Executive decided that the Army should be used to distribute fuel from the oil refinery, the strikers were ready & the refinery workers were already on their way out the gate when the soldiers arrived. With the centenary of the UVF’s Operation Lion this year, it was perhaps inevitable that the 40th anniversary of the UWC strike would receive little attention. However, those 14 days in May, 1974, are no less worthy of commemoration. Ulster Loyalism, unified & determined, took decisive action against an undemocratic & flawed ‘agreement’, took control of their own destiny (& of much of Northern Ireland) sent out a clear message of defiance & ensured that the principle of consent would have to be enshrined in any future agreement. Detractors will, of course, say that the UWC strike was merely a matter of UDA intimidation & a weak government giving in to the rabble. An almost comical (& absurdly reductionist) view of history, proffered by those who often dismiss the UDA as being mere ‘corner boys’ & thugs. Of course, they cannot have it both ways. Either the UDA were, indeed, amateurish thugs, or, they were a sophisticated mass movement, capable of bringing industry & commerce in NI to a grinding halt, & thus bringing down a government. Real history though, is far less monochromatic. Yes, the UDA were intimately involved in the strike, but it was not the UDA that smashed the Sunningdale ‘Agreement’ into a thousand pieces, it was the Loyalist & Unionist body politic. In March, 1973, the government published a White Paper, outlining plans for a Northern Ireland Assembly to replace the illegally prorogued Northern Ireland Parliament, dismissed, in spite of popular local opposition, in 1972. This proposed Assembly would be elected by proportional representation with 78 members sitting at Stormont. In addition to having a power-sharing executive the White Paper also proposed a ‘Council of Ireland’, suspected by many Loyalists as being a device with which the UK government would deliver NI into a unitary, all-island, Irish republic. In June of that year the Assembly elections took place & on Tuesday, 31st July, the Assembly meet for the first time. Ulster had been ravaged by 4 years of bloody, internecine conflict. The Left-wing Official IRA & the more sectarian & nationalistic Provisional IRA, had bombed the commercial heart out of Belfast. Murders & gun attacks were commonplace. Explosions had occurred in every corner of NI. The Loyalist tactic of defeating the OIRA & PIRA by removing their support base was ineffective, the killing of ordinary members of the Irish nationalist/republican community having little effect on the leadership of either republican organisation. In desperation, the government looked for some form of political agreement which might, possibly, undermine support for the OIRA & the Provos, create some type of political consensus, & maybe bring about peace. On the 21st of November, 1973, the UUP, SDLP & Alliance parties reached agreement on the formation of a ‘power-sharing’ NI Executive. A few days later, at the beginning of December, a conference was held in Sunningdale, Berkshire, England. The so-called ‘Sunningdale Agreement’ set the parameters of the ‘Irish dimension’ in the government of Northern Ireland. It also laid the foundations of the crisis which was to come. By the end of January, 1974, the Unionist party’s internal divisions could no longer be contained, the anti-Sunningdale majority, led by Harry West, triumphed & former leader Brian Faulkner (who was also now head of the new NI Executive) walked away from the party, forming his own (much smaller) pro-Sunningdale, Unionist Party of Northern Ireland. Of course, the will of the people, democratically expressed at the ballot box, was ignored, both by the Westminster government & by the new Northern Ireland Executive. On the 14th of May, a motion was debated in the assembly, condemning the ‘Council of Ireland’ & the so-called agreement concluded at Sunningdale. The motion was defeated by 44 votes to 28 (the assembly being made up, almost by default, of pro-Sunningdale members) At 6.00pm, following the conclusion of the Assembly debate, Harry Murray announced to a group of journalists that a general strike was to start the following day. Thus, the dye had been cast. In the face of the assembly’s flagrant disregard of popular opinion & the Westminster government’s apparent disdain for normal democratic processes in Ulster, the Unionist/Loyalist community was left with little other option but to attempt to force the government’s hand. The Ulster Workers Council, the organising body of the proposed strike, issued a statement saying: “The UWC are determined that the Government shall not ignore the will of the majority of the people as to the form of Government or the Sunningdale agreement. The attitude of Government has made a nonsense of political action. The Workers have resolved to make an all out effort to bring about a change” No one could have predicted at the time, the seismic shift that was about to take place within Loyalist/Unionist politics, the astounding events which were about to take place, or the ramifications those events would have, not only in the short term but for generations yet to come. Initially the response to the strike was relatively poor. Many, unsure of how such an action could be successful, choose to go to work as normal. However, following a number of Workers meetings, hastily convened in offices, factories & engineering works across the country, people began to leave work in ever greater numbers. That evening the port of Larne was seized by local Loyalists & sealed off to all traffic. A large number of roads had been blocked in every county & in Belfast buses were hijacked & used as mobile barriers. Electricity supplies were disrupted, with rotating four hourly blackouts across NI. These power cuts forced many factories (those that remained open) to close & send their workforce home. The UWC moved to calm fears of food shortages by issuing a statement assuring the delivery of “all essential services”. For the doubters & naysayers who had confidently predicted that the strike would come to nothing, Wednesday, the 15th of May, 1974, proved to be something of an eye-opener! PART 2 WILL FOLLOW LATER THIS WEEK!